Engine: Briggs & Stratton 10 hp, 4-cycle, Easy-Spin starting, heavy duty air-cooled, with micromatic ignition and mechanical governor. Crankshaft: Mounted and rotates on ball bearing. Valves: Stellite exhaust with Stellite seat for longer valve life. Air Cleaner: Oil Foam with special rotating screen which centrifuges leaves and clippings out of cooling air. 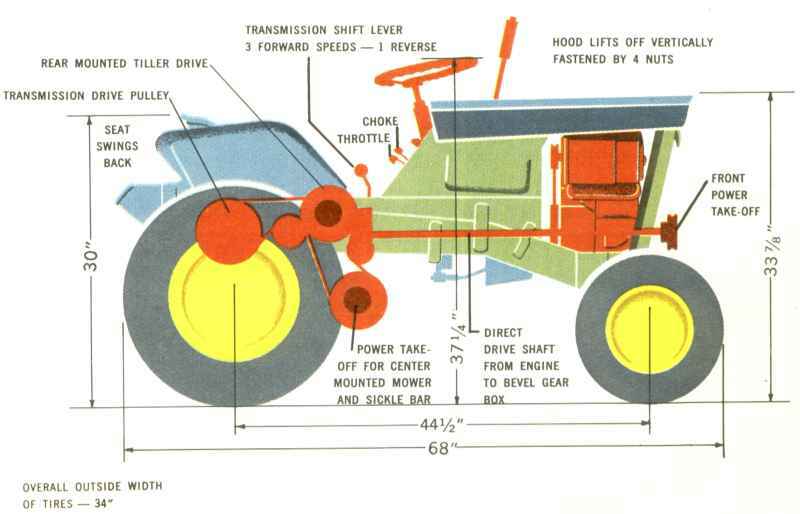 [Note: This is an error in the source document -- the rotating screen is over the inlet for the engine's cooling fan, and not over the carburetor's air cleaner. Differential: Spur gear, precision cut, carburized and hardened with built-in controllable friction. Frame: Electrically welded, heavy gauge of new inverted channel type.New Steering Gear: 4.1 to 1 ratio. Speeds: 3 speeds forward plus reverse. Gear ratios with standard pulleys, 156 in first, 66 in second, 40 in third. Gear ratios with tiller pulleys, 194 in first, 82 in second, 50 in third. Planetary ¾ to 6 mph. Tires: Front 4.80 x 8 studded-tread 2-ply. Rear 8.50-12 suburbanite-tread 2-ply. 3-stage voltage regulator for quick recharging. Power Take-Offs: Smooth power flow with power take-off available to front, center and rear; eliminates costly extra engines.